Last year, through the generosity of thousands of donors in Calgary, $1.6 million was raised through YMCA Strong Kids. These funds provided more than 20,000 children, teens and young adults with a YMCA experience. THANK YOU! 100% of donations raised goes directly to children and youth so they can belong, grow, thrive, and lead. There are children, teens and young adults in every community who are financially unable to take part in important physical activity and developmental programs. 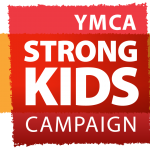 Read Y stories about YMCA Strong Kids.